The Upper West Region is rich in natural attractions largely undiscovered by tourists. Its wide expanse of savanna grassland is dotted with baobab trees. Hippopotamuses can be seen in the river gorges and in the Gbelle Game Reserve where elephants, bucks, and exotic birds are protected. The largest crocodiles in the region can be seen in a pond in the tiny rural village of Kaleo. Many fascinating geological formations can be seen around as well. The caves around Kaleo also have historic significance; local people used to hide from slave traders in them. The footprint of an anti-slave hero can still be seen on the trunk of a baobab tree in Jirapa. At Gwollu is a mighty defence wall, said to have incorporated the bodies of people who helped the slave raiders. The royal palace in the regional capital, Wa, is still in use by the chief of the Wa people. The local villages, with their traditional round mud huts, are fascinating in themselves. Traditions are still kept alive in the Upper West. The people spin, weave, and make smocks, musical instruments, pots, and carvings. Most of the region consists of agricultural land, though development is now taking place. It can be difficult to reach the more remote areas when there are heavy rains. 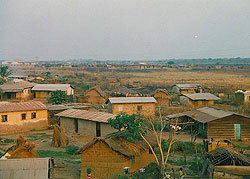 The capital of the Upper West Region, Wa lies in the semi-arid area south of the Sahara. It can get as hot as 42 degrees Celsius here in February and March. The town is still quite rustic in nature, with most of its people engaged in farming. Upland rice is grown here, though the local staple is millet, which the residents cook as porridge. Mango trees are plentiful. Wa is the only city in Ghana city with a Muslim majority, and there are some Islamic architectural gems in the town, such as ancient Sudanese mosques and some newer mosques. The Wa-na palace, which is five centuries old, exhibits a blend of Sudanese and Moorish styles. Other places of interest in Wa are the museum and the hippopotamus sanctuary. The town is a transportation hub, with major roads to Kumasi and to other regions. It also has its own small airport.